Tube Strikes: Sod the Trains, Take the Boat! This month’s strikes are the first I’ve been affected by in the two and a half years I’ve lived in London. You see photos of apocalyptic style crushes and chaos as people attempt to get ona bus instead, but actually if you’re sensible you can miss all of that. I got into work early, left a bit later and discovered a brand new way of travelling through London: the River cruise. The boats on the Thames are free during tube strikes and run from the City all the way to the Southbank. The queues were minimal and the boats themselves were comfortable, warm and fast. There’s even a Costa Coffee on there – you certainly don’t get that on the tube! Watching the crowds go over London Bridge as we sailed underneath, I actually felt happy to be on a form of London transport, something that has definitely never happened before! 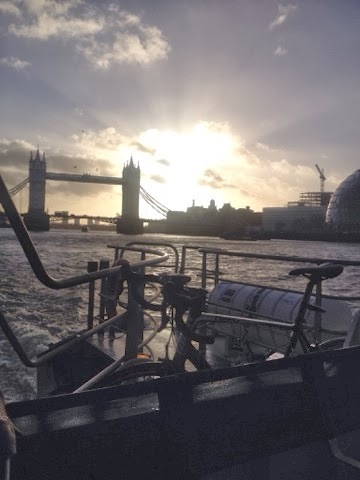 The photo above is the view of the Tower of London as we set off towards Embankment; I’m sure you’ll agree that it was a great way to see the positives of an otherwise inconvenient commute.